The Shelton Hotel is a lovely 2 star hotel giving you excellent contact with all of London's major sights at LOW rates. The bedrooms have recently been refurbished, providing you with relaxed, tranquil and clean surroundings. The London Shelton Hotel is an oasis of tranquillity near the heart of Central London. With just 20 minutes to travel to London, and our wide choice of single, twin, double and family rooms, staying at the London Shelton has never been better. With the gorgeous Victorian Finsbury Park located in close proximity, your stay at the London Shelton will be a great experience with its recently refurbished en-suite bedrooms. Friendly staff make sure you are given an efficient and prompt service, ensuring you get the most out of your stay in London. You may check in from 13:00 hours onwards. In the event of a no show or a cancellation with less than 1 day notice prior to the date of arrival, an amount equivalent to one nights average cost of accomodation will be charged. One of London famous parks, often hosting funfairs and concerts. One of England's most famous football teams plays at Highbury soon to move to Islington and Ashbourne Grove. North London's second biggest football team. Standard Double, recently refurbished, very clean with a modern and simple decor. Standard Single, recently refurbished, very clean with a modern and simple decor. Standard Triple, recently refurbished, very clean with a modern and simple decor. Contains 1 double & 1 single beds. NICELY DECORATED TWIN ROOM WITH 2 SINGLE BEDS. The Indian Restaurant will open soon serving excellent Indian cuisine. 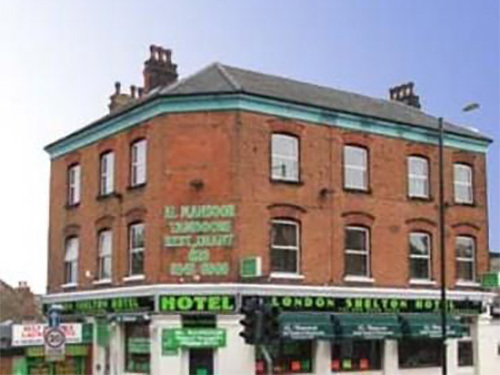 The London Shelton Hotel is located just 4 minutes walk from the beautiful Victorian Finsbury Park with its boating lake, athletics track, cricket pitches,open air cafes and flower gardens. 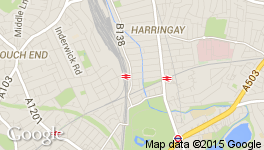 Closest Tube stations are Manor House and Finsbury Park on Piccadilly or Victoria Line. Numerous buses stop in front of the Hotel, or on even more Green Lanes, which is 4 minutes walk. Finsbury Park is only 15 minutes from central London on the underground, easily reached from Heathrow by tube or from Stanstead, Luton and City Airports by car or public transport.Silverlink train stations Green Lanes and Crouch Hill are 10 minutes away. Local places of interest include Wood Green Shopping City, Alexandra Palace, Docklands,Islington Upper street, and Camden Town, with its vibrant street markets. For the sporting fan, Arsenal and Tottenham football grounds are nearby and the Michael Sobell Sports Centre is only minutes away. The Hotel is only a few minutes walk away from both Manor House Tube Station and Finsbury Park Stations, both tube and main line. ParksideHotel.com - find and book hotels and hotel accommodation in / near Seven Sisters Road, Finsbury Park, London.